Adjust your mini drill press to get the results you want for the tasks you do using these easy instructions. 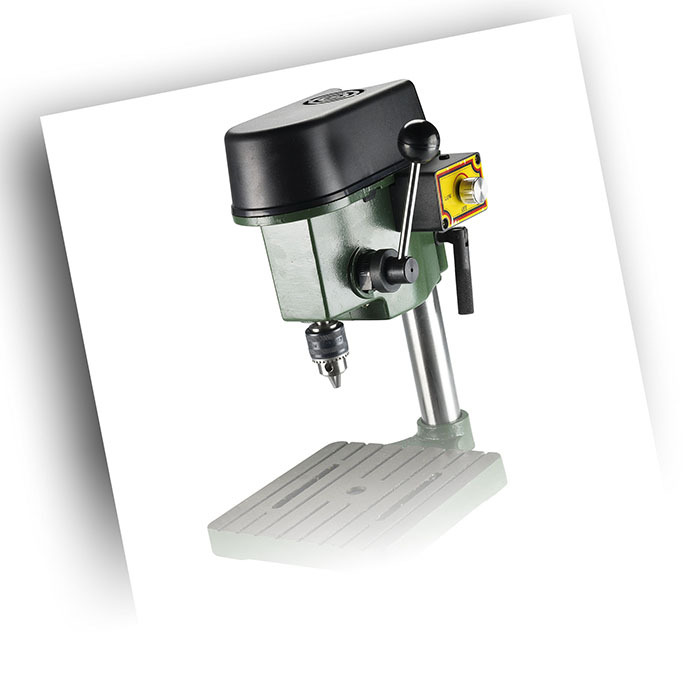 Your drill press has a three-tier, variable-speed capability and can run at a maximum of 5000, 6500 or 8500rpm. The feed lever features an adjustable depth gauge and the drill head is easily adjustable for height. Maximum drill height is 5"; the chuck accommodates shanks up to 0–6mm (1/4"). 1. Assemble the press using the instructions in your operator's manual. 2. Secure the base of the press to your bench or work surface. 3. Plug the power cord into an appropriate power outlet. 4. Set the speed dial to low, medium or high speed to initiate power. 5. Pull the feed lever down to begin drilling. 1. Remove the black plastic cover from the headstock by simultaneously pressing the locking tabs located in the drill housing. 2. Move the belt to the set of pulleys corresponding to the desired speed--the upper pulley offers a maximum speed of 5000rpm, the middle pulley runs at a maximum of 6500rpm and the lower pulley offers the highest maximum speed, 8500rpm. 3. When the belt is on the correct pulley, replace the black plastic cover and snap it into place. 1. Turn the drill on. With the drill running, turn the speed control knob on the front of the control box counter-clockwise to the lowest setting. 2. Locate the small rubber plug in the top of the speed control box and remove it. 3. Insert a small, slotted screwdriver straight down into the hole to engage the adjustment control. 4. With the screwdriver, slowly turn the adjustment control counter-clockwise until the the spindle is moving at the slowest speed but still turning (approx. 1/8-turn and 1/4-turn). 1. While firmly holding the drill head, loosen the black key located at the back of the drilling head. 2. Slowly lower or raise the head to the desired height, and tighten the black key to secure it in place.